How Do You See Other Animals? As just "things" or something more? 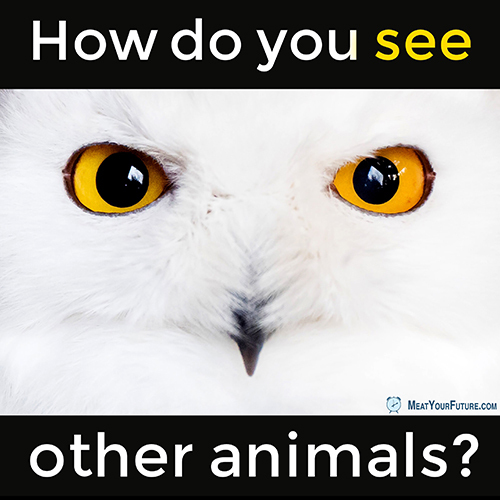 How Do You See Other Animals? As just “things” or something more? Are other animals mere “things” for our use and disposal, or do we have an obligation to take their interests into account? We believe the latter. While we are different from other species, and other species are different from each other, *all* sentient animals share the same basic interests in wanting to avoid pain and suffering, and to preserve their lives. When we enslave animals, and impose harm and death on them, we are violating these fundamental interests. And, if we believe animals are more than just “things”, then we need a very good justification for doing so. So, what justification do we have for imposing harm and violating their most basic interests for things like food, clothing and other purposes? We humans have exactly zero biological need to consume any animal foods for our health (and, in fact, we are usually healthier avoiding them altogether). Once you acknowledge that, there is no compelling justification to continue intentionally harming and killing animals for food. Nor is there any reasonable justification to continue exploiting and harming them for things like fashion or entertainment. Animal experimentation is a more complex topic, but we believe there is not a sufficient justification for the trauma and harm we impose on animals in laboratories either, particularly since there are other (usually better) non-animal methods available. So, how do you see other animals? If, like us, you agree that they are more than just “things” and we have an obligation to take their interests into account, then it follows that (at a minimum) we are obligated to avoid using and harming them wherever possible. And that means living vegan.